Planting spring bulbs in the fall is as natural as falling leaves and football games. It is an opportunity neglected by the home gardener if he does not include some of the hardy, easy-to-grow spring beauties in the garden this fall. Bulbs are truly some of the simplest of flowers to grow, easy to care for, and inexpensive. All they ask is a fall planting, and they will reward you with weeks of early spring color, fragrance, and beauty. Success with spring bulbs will depend to a large extent on selection of good, healthy, quality bulbs. Second-rate bulbs or bargain bulbs produce second-rate flowers, and often first-rate disappointment. To be assured of top quality bulbs and desirable varieties, order or purchase bulbs as early as possible. In general, good bulbs produce flowers the first season after planting, as the flower buds are already formed when the bulbs are purchased and planted. This emphasizes the importance of purchasing quality bulbs, as the quality of flowers is determined by the bulbs and not affected to a great extent by cultural conditions or growth practices. One can be assured that the larger the bulb, the larger the bloom. Many disease problems can also be eliminated by obtaining healthy, disease-free bulbs. If you purchase bulbs early, before planting time in October and November, store them in a cool, dry, well-ventilated area until planting. 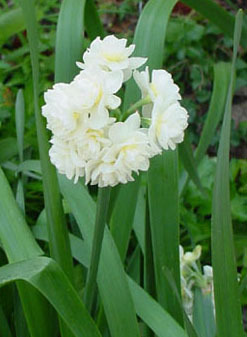 Excessively high temperatures will cause the bulbs to dry out and result in injury to the flower bud inside the bulb. When thumbing through a colorful bulb catalog, one quickly sees the wide variety and selection of spring bulb choices. The grower, however, should be aware that not all varieties produce well in the South, out of their native colder areas. Yet there remain enough successful types to make the decision about which to choose very difficult. Texas growers may choose from daffodils or narcissus, tulips, Dutch hyacinths, French-Roman hyacinths, grape hyacinths, Ipheion and Dutch iris, and leucojum, to name a few. Some spring bulbs, such as tulips and Dutch hyacinths, require a cold treatment prior to planting to have them perform better in the South, where the winters are comparatively mild. Tulips and Dutch hyacinths should be placed in the vegetable bin of the grower's refrigerator for 45 to 60 days prior to planting. They should never be frozen, and should be planted immediately upon removal from cold treatment. An early selection and proper treatment of bulbs now will insure a beautiful and colorful spring, come March. As you select spring-flowering bulbs, set a few choice ones aside for indoor forcing. They will add a bit of cheer and color to the indoor landscape during the winter months. Bulbs that are good for indoor forcing include crocuses, grape hyacinths, daffodils, and tulips. Pot the bulbs as soon as they are available. Prepare the soil by mixing equal parts of soil, peat, and sand. Place a one-inch layer of gravel in the bottom of the pot. Firm the soil around the bulbs, leaving the tips of large bulbs showing above the surface. Barely cover small bulbs, and space them about one-half-inch apart in the pot. Newly potted bulbs should be stored at temperatures from 40 degree to 50 degrees F, for 10 to 12 weeks. Success with forcing bulbs depends upon the development of roots during the cold-storage period. Keep the soil moist but not saturated. The vegetable drawer in the refrigerator provides excellent cold storage conditions. After cold storage treatment, place the bulbs in a cool, semi-lighted location. Gradually move them to a sunny location for good growth and color. Do not allow the bulbs to dry out any time during the forcing period. Most bulbs will be in flower by January. However, if you purchase pre-treated bulbs, it is possible to have blooms by Christmas.